This may be my last post about the 944R, as it will be going to a new home soon. Regardless, there is yet another technical issue that I want to discuss and that is the alignment specs for the car. The caster on the front wheels is set at 86 deg. Caster is how far the vertical centerline of the front wheels “leans back” from vertical. Caster is vital in causing the front wheels to return to the center when you release the steering wheel from a turn. A caster angle of 90 deg would pretty much eliminate the restoring force. Too much caster makes the steering “heavy”. I use a digital angle finder to measure the caster. 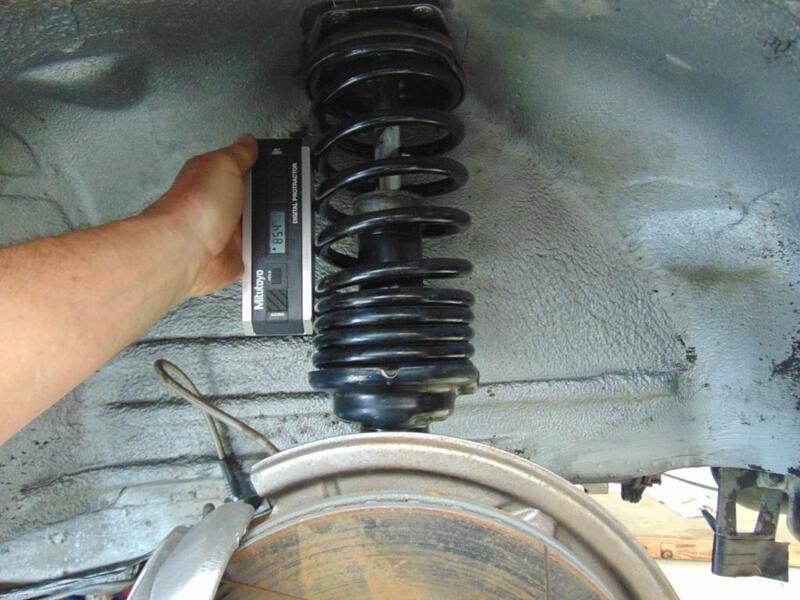 It can be measured by checking the inclination angle of the coil spring on the front struts. BTW, caster does not apply to the rear wheels on a 944. The toe-in of the front wheels was set 1/16″ negative across the width of the 15″ wheels. You can use trig to convert this to an angle and it comes out to be 0.24 deg or about 15 min. I understand that due to the “play” in the wheel bearings and steering gear, the toe will tend to be zero when the car is running down the road. Toe-in on a 944 is adjusted by turning a threaded connection on the steering tie-rod bars. The toe-in is also adjustable on the rear wheels and was set at zero degrees. 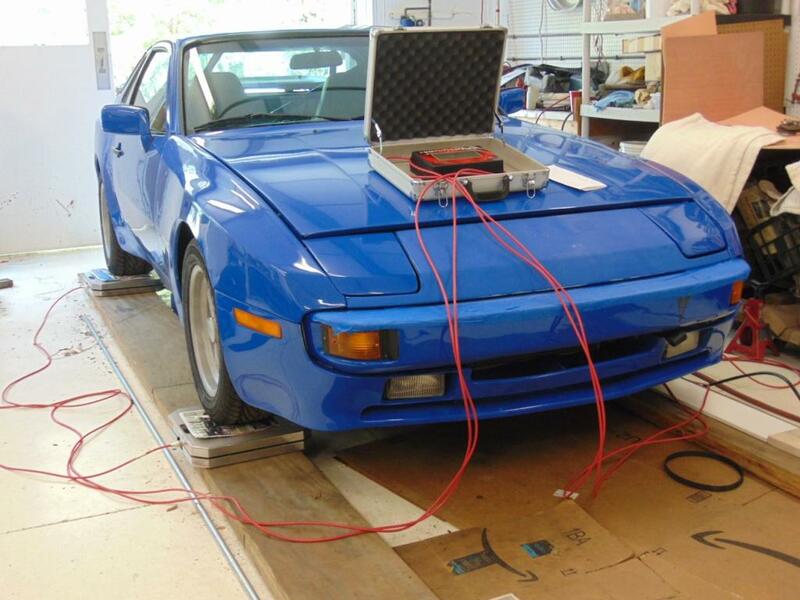 I use a ruler and a set of nylon strings aligned parallel to the centerline of the car to check toe-in. Camber is the most interesting value. 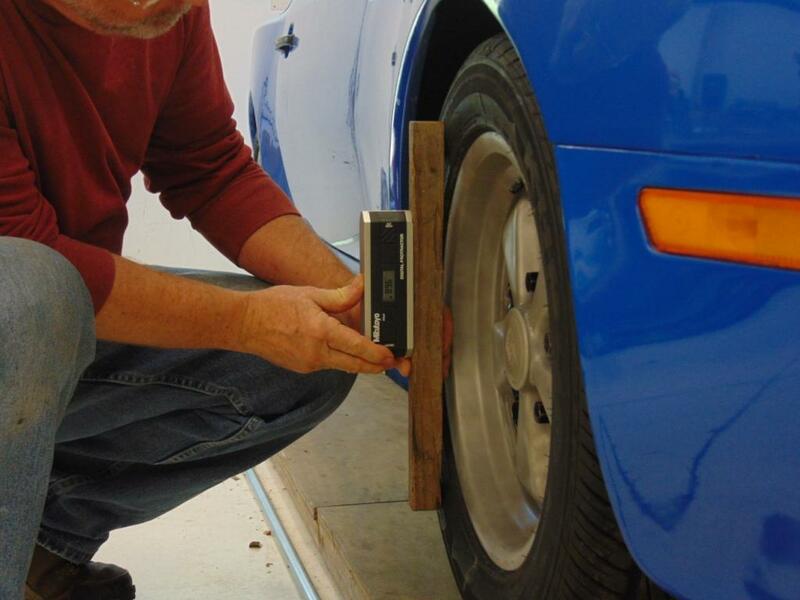 Looking head on at a car, if the top of the tires leans inward towards the center of the car, that is negative camber. On a 944, the camber can be adjusted substantially on the front. At the rear not so much. Camber is a deep subject that I won’t go into here except to say certain track tires will provide more cornering force with camber values that range from 1 deg to 5 deg. If you look at the data on Tirerack.com for track specific tires like the Toyo Proxes they will actually recommend camber settings for the tire, unlike street tires. The camber on the front tires of the 944R is set at 87.5 (-2.5) deg and the camber on the rear tires is set at 87 (-3) deg. For normal street driving, this amount of camber is not really noticeable. In the long run, the insides of the tires are going to wear out first. Hopefully, you will wear them out at the track, not going to the grocery store 🙂 At the track, there are some benefits gained in cornering force and the car just plain looks badass with the resulting stance. So you spend a little more on tires. It’s worth it. BTW, previous articles I have done discuss the change in camber on a 944 as the suspension compresses under corning loads. You can look at these articles here and here but suffice it to say, Porsche has done a good job minimizing the changes in camber as the suspension goes through its range of motion. 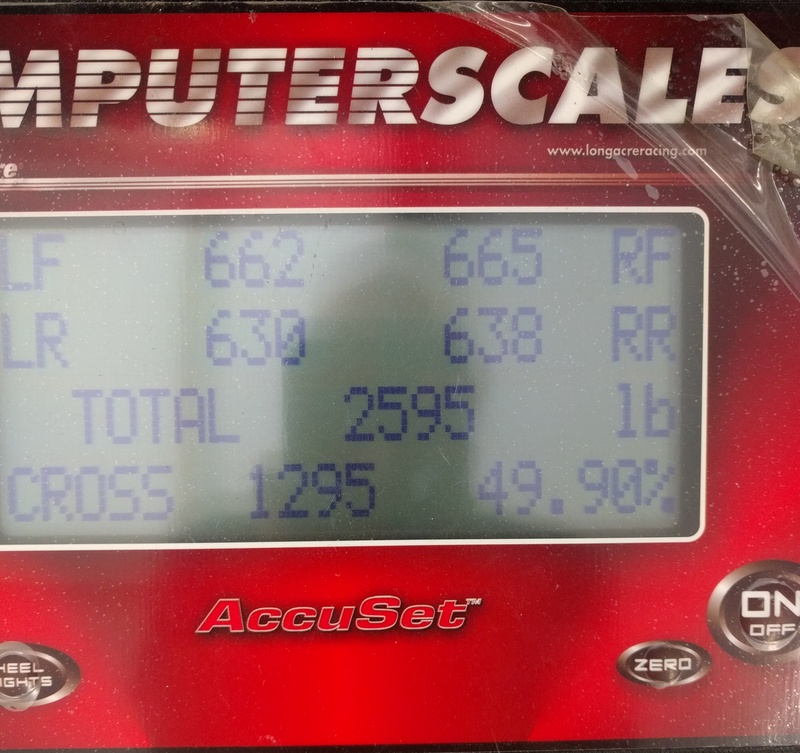 Finally, alignment settings can have a impact of corner weights. The 2nd picture below shows the weights at the four wheels with 1/2 tank of gas and the spare tire and jack removed.